s the official spokesperson for the leader of our country, the Press Secretary has one of the most important jobs at the White House. George Akerson was the first Press Secretary to the President. 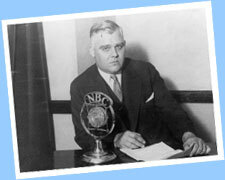 He was appointed to this position by President Herbert Hoover in 1929 and served until 1931. Under President Franklin Delano Roosevelt, Stephen Early expanded the role of Press Secretary, and today the position still reflects his ideas and influence. President Clinton's Press Secretary, Joe Lockhart, briefs the White House Press Corps. Joe Lockhart serves as President Clinton's Press Secretary. Mr. Lockhart's mornings begin very early. When he arrives at the White House, he must be ready to face the media and answer their questions for the day. Mr. Lockhart usually begins his workday with what is called a "press gaggle," an informal meeting in his office with several key members of the White House Press Corps. There, Mr. Lockhart briefs them on the President's schedule for the day and finds out what questions they have. Throughout the rest of the morning, Mr. Lockhart may attend meetings with Administration officials, confer with the President or his key advisors, or research the answers to questions he is likely to receive later in the day. In the early afternoon, Mr. Lockhart calls a formal press briefing in the Press Room in the West Wing of the White House. There the Press Secretary faces the media in a public, on-the-record forum. He responds to questions as accurately and completely as possible. Mr. Lockhart's other duties include helping the President prepare for press conferences, handling press arrangements for the President's official trips, responding to reporters' individual requests for interviews and information, and disseminating press releases and texts of presidential speeches and messages. Because Mr. Lockhart believes President Clinton is helping to move the country in the right direction, he looks upon every press briefing as an opportunity to communicate both information and enthusiasm about what the President is doing for our country. When the lights in the Press Room dim for the evening and Mr. Lockhart makes his way home, he often reflects on his experiences at the White House and his role as Press Secretary for President Clinton  "Working for both is a rare opportunity and an unforgettable experience." George Akerson faces the press during President Hoover's Administration. government and the rewards of public service. If you are interested in a journalism career, he advises you to read newspapers and newsmagazines, use the library for research, and work on your school newspaper. With knowledge, experience, and opportunity, you might one day serve as the President's Press Secretary!